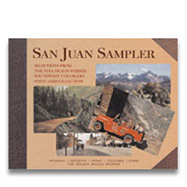 San Juan Sampler is a marvelous book showcasing selections from the Nina Heald Webber Southwest Colorado Postcard Collection. It offers a glimpse of some quaint towns in the San Juan Mountains, and the spectacular Million Dollar Highway that connects them. Take a fascinating journey with these essays and the accompanying historic postcards and learn why so many people are proud to call these mountain towns home. © Durango Herald Small Press 2007-2014. All rights reserved.